All unapproved Citizendium articles may contain errors of fact, bias, grammar etc. A version of an article is unapproved unless it is marked as citable with a dedicated green template at the top of the page, as in this version of the 'Biology' article. Citable articles are intended to be of reasonably high quality. The participants in the Citizendium project make no representations about the reliability of Citizendium articles or, generally, their suitability for any purpose. This article is currently being developed as part of an Eduzendium student project in the framework of a course entitled BEE 4640 Bioseparation Processes at Cornell University. The course homepage can be found at CZ:Cornell_University_2010_BEE_4640_Bioseparation_Processes. For the course duration, the article is closed to outside editing. Of course you can always leave comments on the discussion page. The anticipated date of course completion is 21 December 2010. One month after that date at the latest, this notice shall be removed. Besides, many other Citizendium articles welcome your collaboration! Note to course participants: Looking forward to some insightful and useful articles from your collaborations. The process by which a dissolved chemical species comes out of solution as a solid is called precipitation. It is often employed in bioseparation applications for protein purification and concentration, although it may be used to isolate other compounds, such as nucleic acids and other cell components. Precipitation is achieved by altering the solubility of a target protein in a solution to cause it to become insoluble and thus precipitate, allowing for this concentrated solid to be more easily separated from the liquid phase (supernatant). 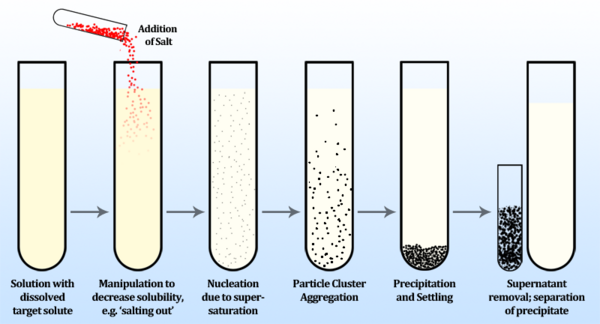 Example of a typical precipitation process, proceeding from an initial homogenous solution to final separation of the target solute. The hydration layers of a protein, image courtesy of Dr. Hunter. 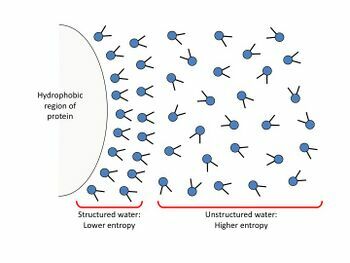 Water molecules form several highly ordered layers on the surface of the dissolved macromolecule, which must be disrupted in order for the proteins to aggregate and come out of solution. Solubility is the property of a substance (solute) – in either gas, liquid, or solid phases – that determines the extent to which it dissolves in a liquid (called the solvent) and form a homogenous (single-phase) solution. It is based on factors such as temperature, compatibility between the solute’s net charge and the solvent’s polarity, the formation of hydration layers, the presence and concentration of other solutes dissolved in the solvent, and solvent’s ionic strength and dielectric constant. Macromolecules (such as proteins and nucleic acids) are typically present in aqueous solvents. They are able to dissolve as a result of assuming a stable conformation in the solvent and then being surrounded by hydration layer(s). When placed in an aqueous solution, the macromolecules adopt a structure in which most hydrophobic (nonpolar) portions of the molecules gather inwards, and most hydrophilic (charged/polar) portions surround the exterior, guided to a final conformation that has the lowest Gibbs free energy. The attraction between the hydrophilic surface of the macromolecule and the polar water molecules creates an interface in which similarly-oriented water molecules associate with, and surround, the solute’s surface to form a highly ordered layer, called the hydration layer (also called the interfacial double layer). The formation of hydration layers enhances the solubility of macromolecules by greatly reducing inter-macromolecular dipole-dipole attraction and thus preventing their association with other solutes. In an aqueous solvent solutes with a higher net charge are more soluble, due to their enhanced ability to associate with water molecules and create a hydration layer, and their lessened inter-solute interactions as a result of increased repulsion from like-charges. Increasing a solvent’s ionic strength (the concentration of ions in solution) decreases the availability of unassociated water molecules, which are required for the formation of hydration layers. This increases intermolecular attraction between solutes and promotes coalescence, thus decreasing the solute’s solubility. where is the solubility of the protein in mol/L, is the solubility at zero ionic strength in mol/L, is the protein’s characteristic salting-out constant (unitless), and is the concentration of ions in solution in mol/L. The most commonly used salt for this procedure is ammonium sulfate, (NH4)2SO4 due to its high solubility, lack of buffering capacity, minimal cost, and the low density of the resulting solution relative to other salts, which aids in centrifugation separation. Plots of Isoelectric precipitation, courtesy of Dr. Hunter. The continuous lines indicate the solubility of the proteins in solution, and the dotted lines indicate the proteins' net charges. As can be seen, when the pH is equal to the pI of the proteins, their net charge is zero, and their solubility is lowest. 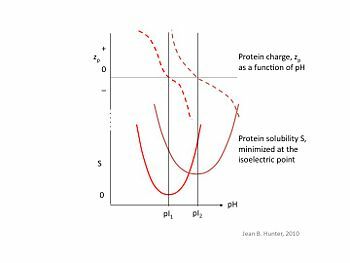 At its isoelectric pH, called the pI, a macromolecule possesses no net charge and thus no like-charge repulsion occurs between solutes. This results in weaker interactions with water molecules and makes the macromolecule more hydrophobic, increasing its affinity for combining with other solutes, and thus allowing for precipitation. Isoelectric precipitation is the process by which the pH of the solution is manipulated to reach the solute's pI to achieve this effect. The addition of a nonpolar solvent like ethanol to a solution typically decreases solubility of highly charged solutes, and is commonly used in nucleic acid precipitation. The nonpolar alcohols compete with water for association with the dissolved solute and destabilize the hydration layer, increasing the solute’s ability to form hydrophobic interactions with other solutes, and decreasing its solubility as a result. Flocculation is a process by which particles of an insoluble, dispersed (but not dissolved), and colloidal substance join together to form flaky aggregations called flocs. Typically, most biological particles suspended in a solution possess a negative charge. This creates repulsion between the particles, which is counteracted by a mutual attraction due to van der Waals forces. Although at short range the van der Waals forces are much more powerful, they decay rapidly with distance and as a result, inter-particle repulsive forces – which act a greater range – typically prevent particles from achieving this required approach distance. Flocculation is achieved by minimizing the contribution of repulsive forces in order to maximize the effect of the van der Waals force, to an extent that allows the particles to move sufficiently close to permit the van der Waals force to drive particle aggregation. The most common process to produce this effect is to increase the ionic strength of the solution by dissolving a salt, whose charged ions interfere with inter-solute repulsion. where is the fraction of collisions that result in permanent aggregates, is the number of particles, is time elapsed, is the diameter of the particles, and is the shear rate. The flocs reach a stable size after a period called the “aging” time elapses. Morr C.V. et al. "A Collaborative Study to Develop a Standardized Food Protein Solubility Procedure." Journal of Food Science, 25 AUG 2006 DOI: 10.1111/j.1365-2621.1985.tb10572.x. Wessel D. et al. "A method for the quantitative recovery of protein in dilute solution in the presence of detergents and lipids." Methods in Enzymology, Volume 114, 1985, Pages 49-77. Harrison R.G., Todd P., Rudge S.R., Petrides, D.P. "Bioseparations Science and Engineering." Oxford University Press, New York, 2003. ISBN: 978-0-19-512340-1. This page was last modified 23:21, 21 December 2010.